My name is Mariano and my user Pedigree Database is "Keilaamstaff" the problem is that this can (Gold_kapo_vak_de_ ruca_baruk) is not mine. and I can not edit it to its rightful owner and user "Valleyguard" whatever it give your dog in pedrigee Database. -a problem is that the figure is mine, but it is not its owner is Valleyguard! and the dog keeps winning awards and can not be edited, so you can delete it enters again? I do not speak English use a translator .. if not clear let me know thank you very much! No you can not delete it. I have your PMs and will get to it, I have been sick and feeling lousy the last few days so took a break here. I will get to this by the end of the weekend. Thank, thank you very much! 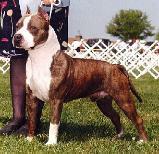 Valleyguard is now the editor of this pedigree. Sorry, it took so long.